Club programs help develop fitness, a positive use of leisure time, reduction of stress, appreciation for the environment, and social and interpersonal skills. 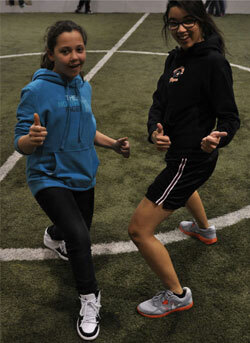 We offer our members the opportunity to try out new sports, build athletic skills, and to simply have fun! Programs are always affordable. A 7-week, arena-style flag football program for four age divisions followed by a Superbowl. Participants will play one game per week. All players receive a t-shirt. A 10-week program of basic weight training and cardiovascular workouts. Participants will be monitored by staff and receive an individualized performance plan. All participants receive a t-shirt. Cheers, motions, stunts, jumps and dance motions for inexperienced and experienced cheerleaders. The program runs for 8 weeks, with a performance the last week for parents. Age groups include 4-6, 7-9 and 10-13. An 8-week, noncompetitive soccer program. Each session begins with skill practice, followed by a game. Participants are placed on teams based on age, for ages 4-7. A noncompetitive fundamental basketball league for players of all skill levels, experienced and inexperienced players. Members will learn a new skill each week, and take part in half-time games and challenges for prizes. Designed to teach your child the fundamentals of the game while learning sportsmanship and having a good time. League will run for 8 weeks with one game each week, including playoffs and a championship. A fundamental league for fun-filled hockey action. All members will learn basic techniques and skills prior to playing in a weekly game. An indoor baseball program for youth ages 6-12 designed to sharpen skills in the off-season. Members will play standard baseball games indoors using a soft bat and whiffle ball. No equipment is needed. Designed to teach the fundamentals of the game while learning about sportsmanship and fair play. This league is an 8-week program which includes a playoff and championship, for children ages 8-11. Consists of various sports and fitness activities. Participants will take part in weekly challenges and record their results. They will be able to compare their results with other Boys & Girls Clubs across the country. Gives members the opportunity to have another recess during the day. Members will play a variety of games for 45 minutes in the gymnasium. Yearly weight room memberships are available to high school students. Ages 16-18.